"All the news that's fit to print", a credo for impartial and credible journalism from 1851, is in the deepest crisis known to the history of the print media. The printing ink of the newspaper has given way to the translucent liquid crystals, the rustling of the paper to wiping on electronic devices. The change of the materiality of newspapers in the era of the Internet and rapid technical progress is a fact. This is accompanied by the fast pace and superficiality of the information, which is the primary interest of the Chilean photographer Enrique Muñoz García (*1969 in Ancud, Chiloé Island, Chile) living in Biel. 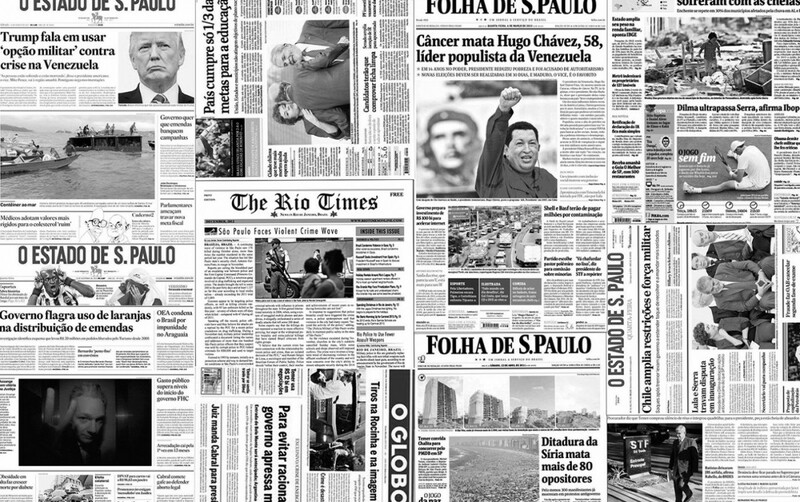 Against this backdrop, Enrique Muñoz García's work Sao Paulo News impresses with its formal simplicity and relevance of the content. With his collage of newspaper articles from various daily newspaper, he focuses on the current events on the day the exhibition opens. An inconspicuous day ... At second glance, however, he raises much deeper questions: who decides which information has the value of a daily news and is published on the front page? What information remains untold and hidden to the public? Out of interest in the processes that influence the news production and opinion shaping, Muñoz García moves in this gray area inherent to the medium, this gap between information production and its reception, appropriation and production of reality. In this very zone, where control mechanisms are at stake, Muñoz García repeatedly puts the mass media as an important instrument of democratic processes to the test.